Dry roast split mung beans till it turns light golden brown. Once roasted take the split mung beans & rice grains wash them together, keep aside. Heat the oil in a big sturdy pot. Note: It is better to use non-stick pot to avoid the rice from sticking to the bottom. Add pepper, cumin powder, turmeric powder & cashewnuts, sauté for 10sec. Add rice & split mung beans. When it starts boiling, keep in low flame. Occasionally stir to avoid sticking to bottom. Cook till rice absorbs all water & it reaches a semi liquid state. Spicy Pongal is ready to serve hot with coconut chutney. Note: It gets thick when cooled so don’t let water to dry out completely. I cooked in Rice cooker. Can also be pressure cooked for 3 whistles. ohh...I ve wanted to try same too...yummy presentation.. 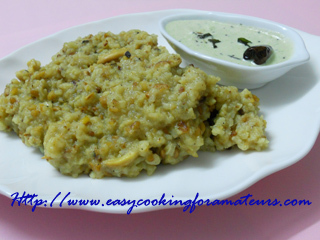 Very comforting and fingerlicking pongal.